CANCUN, Mexico, December 9, 2010 (ENS) – Three travel-weary teams driving three world-famous electric vehicles have arrived at the UN climate change conference in Cancun after 71 days on the road competing in the so-called Zero Emissions Race. 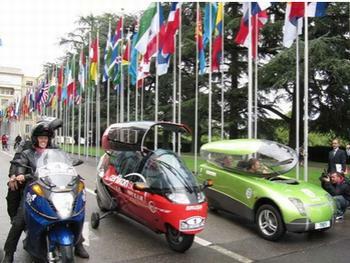 The Zero Race is the brainchild of Swiss environmentalist and inventor Louis Palmer, who last year became the first person to circumnavigate the world in an electric car. “The teams are doing extraordinary well, and the race has arrived according to schedule in Cancun, where they participate at the World Climate Change Conference, and preparations for maritime shipping to Europe,” Palmer said on Tuesday. “During this longest and hardest electric car race ever, the challenges of the Zero Race have been extremely hard to cope with at times at a personal level, exacerbated by the fatigue of 500 kilometers (30 miles) or so daily driving, and the tough road conditions in many places,” Palmer said. Starting from Geneva, Switzerland on August 16, the three teams – from Australia, Germany, and Switzerland – have traveled 25,170 kilometers, driving across Switzerland, Germany, Belgium, Austria, Hungary, Ukraine, Russia, Kazakhstan, China, then shipping their vehicles across the Pacific to Vancouver, Canada and traveling south across the United States and Mexico. In Cancun, UN Environment Programme Executive Director Achim Steiner greeted Palmer and the race teams. 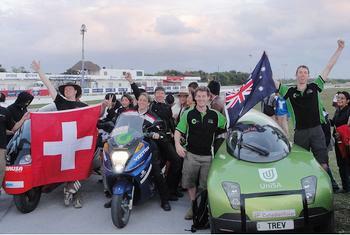 After their pit stop in Cancun, the teams from Australia, Germany and Switzerland will set out once more, aiming to arrive at the finishing line in Geneva by January 22, 2011. Each plug-in electric vehicle is required to carry two passengers and drive at least 250 kilometers at an average speed of at least 80 kilometers (50 miles) an hour. The vehicles can travel at least 250 kilometers on a single charge. The Zero Race is not about speed, but about other criteria such as vehicle reliability, energy efficiency, utility to every day life, design and safety. Almost every day, the teams face competition against new criteria in these categories, and they receive points according to their performance in each. So far, the Swiss team is leading, ahead of Germany and Australia. A South Korean team dropped out of the race early due to technical difficulties. The Swiss team is driving the two-seat electric scooter Zerotracer made by Switzerland’s OC Oerlikon Corp. AG. “When you are driving the Zerotracer, it feels like you are flying half-a-meter above the ground,” said Zerotracer designer Tobias Wulser of the Swiss design firm Designwerk. “You forget that you are in a fully enclosed motorcycle. The vehicle is fast and has great acceleration,” he told ‘Wired’ magazine. The German team is on a modified series production electric scooter, the Vectrix, driven by Berliners Sandra Lust and Sven Lehmann. With a top speed of 99 kilometers per hour (62 mph), the Vectrix, designed in the United States and manufactured in Poland, is the first commercially available high performance electric scooter. The Vectrix uses nickel-metal-hydride batteries that can be recharged to 80 percent in two hours from a standard domestic power socket. The Zero Race is a “green” event, said Palmer, and participants are doing everything possible to travel in a responsible way. Any greenhouse gas emissions created by the event, including the shipping of cars and flights by participants, will be compensated by investments in renewable energy projects through the Swiss-based non-profit foundation myclimate.org – the Climate Protection Partnership. Each team has already produced enough power for their vehicle from renewable energy sources including as solar and wind, and this has been fed into the power grids in their home countries. Zero Race sponsors include the United Nations Environment Programme and Google Inc., UniSA, Google Australia, Galaxy Resources, EcoGreen Electrical, Design Ecology, ABN Newswire and Catcon. The transport sector is responsible for about one quarter of all energy-related carbon dioxide emissions. Steiner estimates that in 40 years, the number of vehicles in the world will have tripled, with over 80 percent of that growth occurring in developing countries.